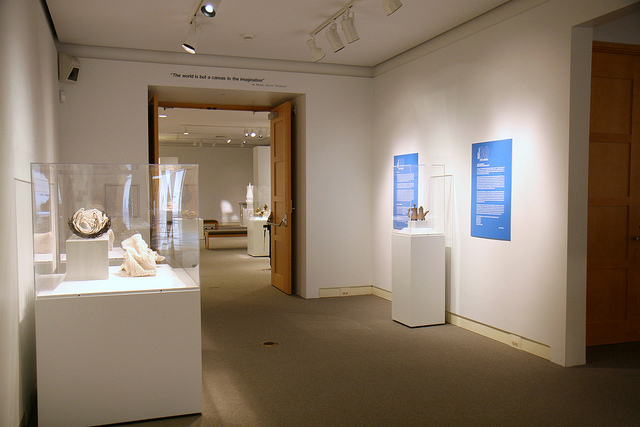 Alice C. Sabatini Art Gallery, installation view of prior Topeka Competition 30, 2011. Photo courtesy of the Sabatini Art Gallery, Kansas. This Friday evening, December 6th, the Topeka Competition 31 will open: a juried exhibition of one-of-a-kind fine craft and 3-D art hosted by the Alice C. Sabatini Art Gallery in downtown Topeka, Kansas. I’m pleased to be one of the chosen artists to exhibit. Sarah Perkins, Professor of Metals, enamelist-extraordinaire and collections committee member of the Ornamental Metal Museum in Memphis, Tennessee chose 51 works for this exhibit from approximately 216 entries. My Widget Locket #4: Homage to Mexico will be on display alongside outstanding fellow metalsmiths and jewelers, such as Ana M. Lopez (Texas), Abigail Heuss (Georgia), Lynn Cool (Kansas), Gina Westergard (Kansas) and Vincent Pontillo (Indiana). Exactly one year ago this week, I had the pleasure of exhibiting one of my other widget lockets alongside metalsmiths Abigail Heuss and Ana M. Lopez at Raleigh, North Carolina’s Artspace in the Fine Contemporary Craft Biennial, so I’m thrilled to be showing my work in such stellar company again this year. 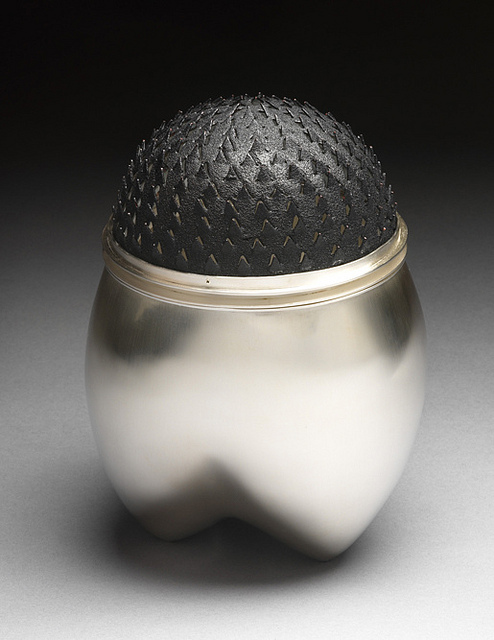 Sarah Perkins, “Pierced Container”. Sterling, copper, enamel, 2010. Photo courtesy of the artist and the Sabatini Art Gallery. In addition, other genres of craft will be represented, such as fiber, glass, clay, sculpture, mixed media and wood. Several exhibiting artists are also on the faculty of universities throughout the Midwest and Southwest U.S.A., such as Washburn University, The University of Kansas, University of North Texas (Denton), and Missouri State University. While Topeka is a bit far from my “comfort zone” of east-coast car travel from the Philadelphia area where I live, I do hope to add additional craft critique and coverage of this prestigious event on artdoesmatter. If you live in or plan to visit the Topeka, Kansas or neighboring Kansas City, Missouri metro areas for the upcoming holiday season, I encourage you to drop in to see this event. The gallery will host a First Friday opening from 5:30 – 8:30 PM this Friday, December 6th, with juror and purchase awards at 6:30 PM. Topeka Competition 31 runs through January 19th, 2014 at The Alice C. Sabatini Art Gallery, located adjacent to the Topeka and Shawnee County Public Library at 1515 SW 10th Avenue in downtown Topeka, Kansas. Thanks so much, Dawn. The galleries look so beautiful and the exhibit designers are so conscientious! I can’t wait to see what the installations will look like. Thanks again for your lovely feedback! Congratulations on this exhibition! Hope you will post some pics of the installations? Beautiful piece! Thanks so much, Kathryn, for your lovely comments! Yes, I do plan to follow up after the opening w/ more details/photos of the installations. I want to also congratulate you on your current ‘Heart of the Heat’ enamelling exhibition in the U.K.; your brooches look just fabulous! Congratulations, Patricia! This looks wonderful… I wish I was a little closer so I could check it out. I do look forward to reading your follow up! Anita, as soon as I received the acceptance letter – I looked on Google maps to track how far away from the Chicago area the gallery was! (My husband knows how much I’ve been hinting towards a trip to Chicago, just to go on an “art and sightseeing tour”.) I do realize it’s a distance from you – hopefully I’ll have a show sometime soon closer to your area. Thank you so much for stopping in and for your lovely comments!! Thanks so much, Sharon! I do believe this will be a new challenge for me, to present feedback on an exhibition from a virtual standpoint, as I’m unable to travel out to see this one in-person this time around. However, I am quite familiar w/ some of the artists who’ll be co-exhibitors, and I hope I can show commentary and/or background info on their pieces. I’m so happy you dropped by to “artdoesmatter” today – I always love hearing from you! Patricia, it’s great to see that your “Homage to Mexico” Widget Locket is being shown again. And to have been selected by Sarah Perkins…that is quite an endorsement! Congratulations! I look forward to reading more about this in your next posts. Dominique – I’m so glad you mentioned Sarah Perkins, as I’m a huge fan of her work. When the call for entries was announced, I knew I wanted to enter and compete for a slot as soon as I found out such a world-class metalsmith and enamelist was the juror. Although I’ve never met Sarah Perkins, I’ve been an admirer of her elegant enameled vessels for many years. Thanks so much for stopping in and for your lovely, encouraging comments! What an honor to be representing the East Coast at this particular exhibition. May there be many more like it! What a lovely thing to say, Gina! Thank you so much. And I really appreciate you stopping by and commenting. Always love hearing from you! Philippa, you make me chuckle!! But in all seriousness, perhaps your idea of my widgets becoming journals of their own travels could be a concept for a new jewelry piece. A blog comment serving as inspiration for a new piece – now that’s a fabulous argument for the importance of social/blog media. Why do you think it’s never a great post here, I feel, unless it includes a visit from you!! Thank you so very much for stopping in – I genuinely appreciate! 🙂 All part of the fun!